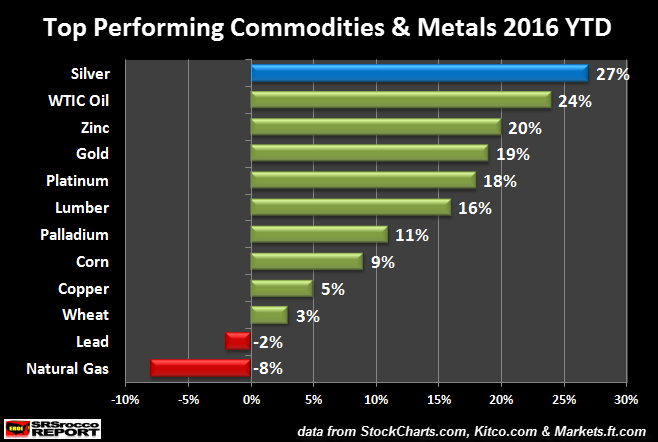 As we scroll down the chart we can see that copper, the king base metal, placed towards the bottom of the list at a mere 5% gain, while lead recorded a 2% loss and natural gas declined the most at 8%. Silver Corp Metals enjoyed the best performance in the group by rising 400% since the beginning of the year. 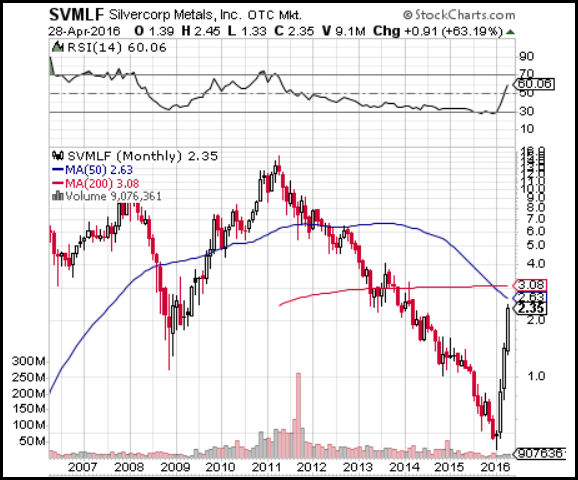 Silver Corp Metals has been one of my lowest cost primary silver miners in my group. However, Silver Corp received a lot of bad press several years ago which made it a target of excessive shorting. At one point, Silver Corp Metals reached $15 in April 2011. But, over the next five years fell to a low of $0.41 in January this year. Silver Corp Metals increased from $0.47 on Dec 31st 2015 to $2.35 on April 28th 2016. Again, this was an impressive 400% move in less than four months. Silver Corp Metals was delisted from the New York Stock Exchange with ticker symbol SVM and is now trading as a pink sheet under SVMLF. However, I believe as the price of silver continues to move higher, Silver Corp Metals will be trading once again on the NYSE. As we look down the list we can see next best performers starting with Great Panther at a gain of 294%, Alexco Resources with 253%, Aurcana with 235% and First Majestic at 206%. The interesting thing about the gains in these primary silver stocks is that they were not based upon their low cost or productivity per say. For example, Great Panther is one of the highest cost producers in the group last year, based on my analysis, but enjoyed the second best performance. Moreover, Alexco Resources shut down their only operating silver mine back at the end of 2013, but their stock price had the third best performance jumping 253%. Actually, most of the lowest cost producers, First Majestic (206%), Fortuna (175%) and Tahoe Resources (57%) saw their performance in the mid to lower half of the group. I was actually surprised by the result after tabulating the data. One of my personal favorites is Fortuna because they rank in the top four lowest cost producers in the group and plan on increasing production over the next 3-5 years. The higher priced stocks such as Pan American Silver at $6.49 on Jan 1st and Tahoe Resources at $8.60, reported some of the lowest gains in the group. So, the idea that picking stocks based on sound fundamentals here doesn’t seem to fly….. LOL. 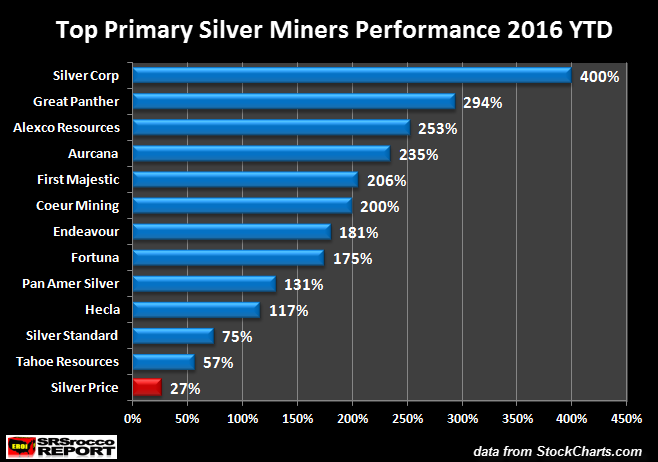 Regardless, I believe the primary silver mining stocks will be some of the best performing assets in the entire market over the next 3-5 years. If you have yet read my previous article, PRECIOUS METALS INVESTOR: Must See Important Charts & Data, you will find some interesting information. Also, please checkout our new PRECIOUS METALS INVESTING page.